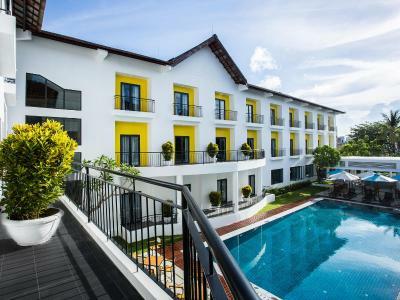 Lock in a great price for ÊMM Hotel Hoi An – rated 8.8 by recent guests! Modern looking, really great location, we loved our stay. Staff were great. Not much atmosphere at the hotel restaurant, but we were happy to walk and find where the locals ate. (tip, go to Mina’s, a little cafe/home thing as you leave the hotel, go left. She was amazing!!!). Great location and helpful staff. The breakfast is excellent. It is so close to the old town. Easy five-minute walk there. Staff were exceptional, friendly and helpful. The rooms and shared facilities were always clean. Breakfast had good variety and food hot. The room was comfortable and clean. Breakfast was good. Staff were lovely, good location, breakfast sensational. Property was clean and it was good value for money. Nice fit out of the hotel, swimming pool pleasant with comfortable sunbeds. Very clean. Staff so nice and helpfull. Breakfasts delicious. Shuttle bus to a private beach, which is the most pretty in the neighbourhood. Good location, close to the ancient Town. 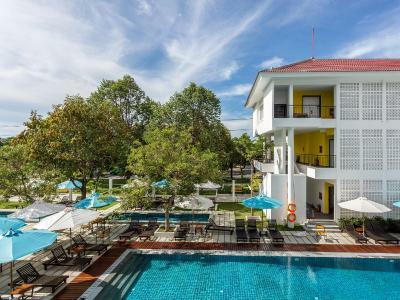 ÊMM Hotel Hoi An This rating is a reflection of how the property compares to the industry standard when it comes to price, facilities and services available. It's based on a self-evaluation by the property. Use this rating to help choose your stay! 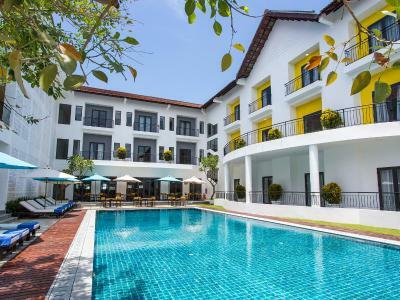 Nestled within private gardens, ÊMM Hotel Hoi An features French-colonial and Vietnamese-inspired architecure and offers 4-star accommodations in Hoi An. Splashes of color remain a signature of the hotel's EMM brand and the hotel has an outdoor swimming pool available throughout the year. 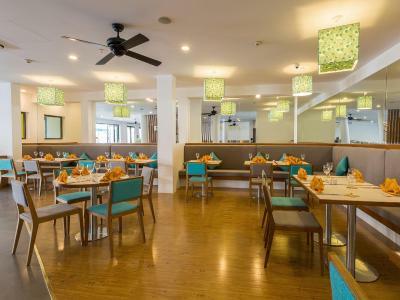 Guests can enjoy meals at the in-house restaurant or a drink at the bar. 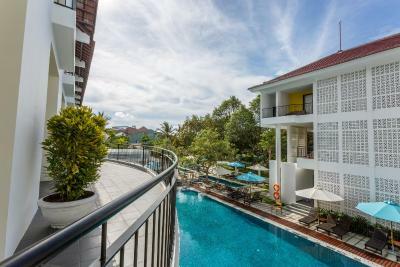 Just 650 feet from the Old Quarter in Hoi An, the property is a 15-minute drive from Cua Dai Beach. Nearby attractions include the Japanese Covered Bridge and Tra Que vegetable gardens. All rooms have free WiFi and cable TVs. 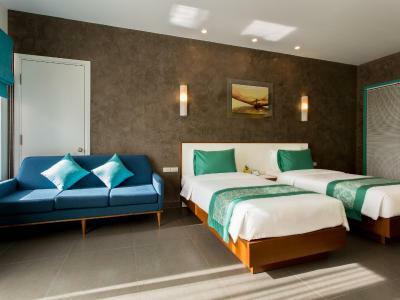 Rooms are fitted with mini-bars and fridges. Its private bathrooms offer bathtubs, toiletries and hairdryers. 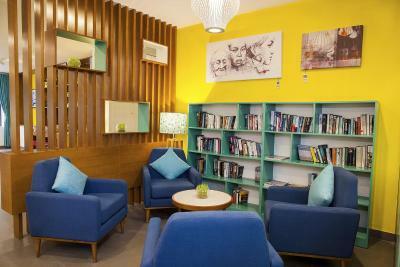 Guests can approach the 24-hour front desk for currency exchange, tour arrangements, concierge and ticketing services. Guests of the hotel also receive free parking privileges. The property offers luggage storage. ÊMM Hotel Hoi An Restaurant specializes in local, Asian and Western food. 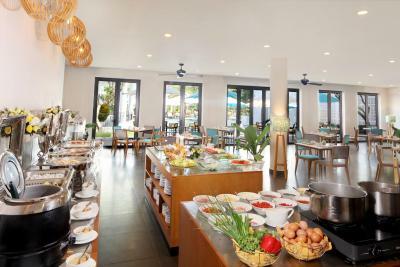 A drink or two can be enjoyed at Pool Bar, which also serves light meals. Son Phong is a great choice for travelers interested in walking, city walks and ambiance. 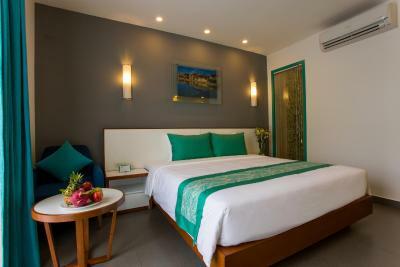 When would you like to stay at ÊMM Hotel Hoi An? Offering views of the gardens, this suite offers its own private balcony. This spacious suite includes a separate living area with a sofa. Includes a cable TV and mini-bar. Private bathroom is fitted with a shower or bath. 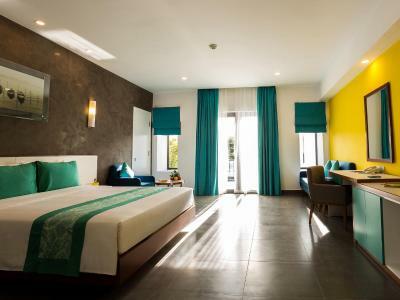 Designed in various styles, these rooms feature its own private balcony and a view of the swimming pool. Rooms come equipped with a cable TV and a mini-bar. Private bathrooms are fitted with a shower or bath. This double room has a cable TV, mini-bar and tumble dryer. This double room features a flat-screen TV, tumble dryer and mini-bar. 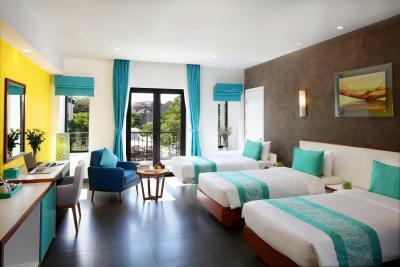 Introducing the newest international-standard four-star hotel in Hoi An’s Ancient Town, ÊMM Hotel Hoi An. 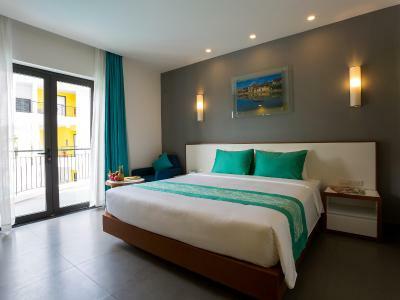 Located a short walk or drive from the best attractions, boutiques and beaches. ÊMM Hotel offers guests the opportunity to easily explore Hoi An and its surroundings. 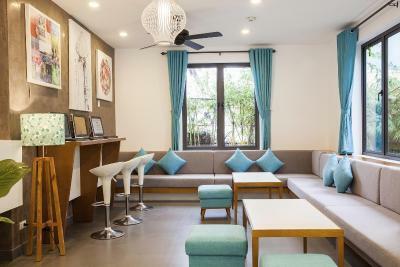 The stylish ÊMM Hotel Hoi An is influenced by a mix of French colonial and Vietnamese architectural themes, with a funky twist of colour, which is at the heart of the ÊMM Brand. 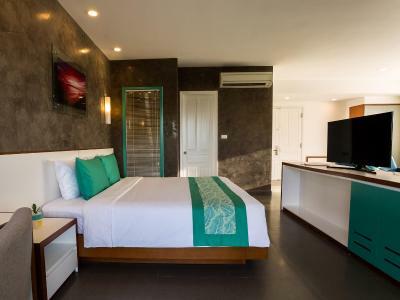 Innovatively designed guest rooms, comfortable public areas and contemporary food and beverage outlets allow ÊMM Hoi An to deliver unique, personalized comfort and service to discerning travellers. Relax by the pool and surrounding gardens after a day spent exploring the Ancient Town, beaches or nearby mountains and ruins ÊMM Hoi An creates a perfect escape amidst the action of the UNSECO World Heritage Centre. Hotel surroundings – This neighborhood is a great choice for travelers interested in walking, city walks and ambiance – Check location Great location - show map Guests loved walking around the neighborhood! House Rules ÊMM Hotel Hoi An takes special requests – add in the next step! One child under 6 years is charged VND 279115.75 per night when using existing beds. All children under 12 years are charged VND 511712.20 per night for extra beds. 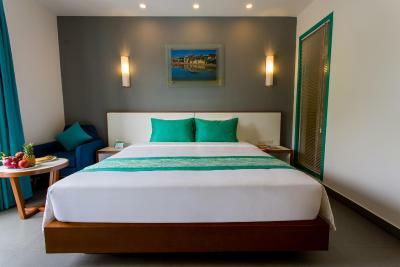 Any additional older children or adults are charged VND 511712.20 per night for extra beds. ÊMM Hotel Hoi An accepts these cards and reserves the right to temporarily hold an amount prior to arrival. The tour buses and lots of luggage blocking the hallways and lifts. Ruined the experience at the end. The very disappointing bicycle tour. The guide took us to a pointless closed market, introduced us to items like... Shallots, spring onions... Everyday ingredients!! She didn't give us any talk or description on the local villages we visited. It felt like we paid her to just take us to the village, to eat, and go home. Overpriced for what it was. She charged us for the juices, even though this should have been included and didn't give us water until I showed her this was on our itinerary. FYI. On day 1... Kettle was slightly broken, bathroom door was broken and wouldn't shut, and door was not able to lock from inside. Why was this not checked beforehand? Nevertheless, this was all solved after I mentioned this. There were no furniture on the balcony, there were no płace to dry wet swimming suit. Location was slightly out of town (around 10 mins walking) but otherwise loved it! Staff were very friendly and helpful with information and organising transfers etc. Room was excellent and very clean. 50% off happy hour was fantastic and and we loved the pool area. Wifi also worked well! Breakfast was ok. Onsite restaurant food was average. 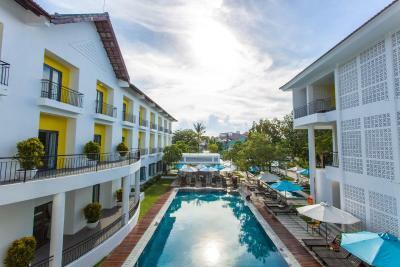 Nice pool, good decor and room and amenities despite being an old refurbished building. Staff was nice and helpful. -try to avoid a room with a connecting door, you will hear everything from your neighbor! we were not able to sleep at night -somehow their breakfast at this hotel is not their strength. 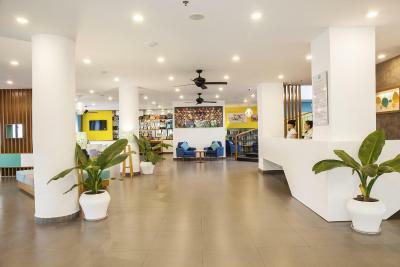 - staff was very friendly and helpful - internet is fast - although the hotel is by the main road, the hotel building is a bit behid the garden so the noise from the street was not botherinh us. The restaurant service during the day wasn’t good. We waited nearly an hour for a baguette and some chips. We ended up walking away without receiving the food as we didn’t want to wait any longer. Water went down on our last day, not a lot of information about when it would come back on. Not the best value for money. Room was a good size. Bed was comfortable. Good check in, very informative about the local area. Pool area was nice, but the weather wasn’t great when we were there. You can get a lovely Vietnamese iced coffee for breakfast (you need to ask for it!). There was a day we did not have water in the morning, however it came back quickly. We got charged 50k dong more at pick up because our flight was delayed.. The location which was a little bit outside of the busy and crowded centre, but still super close. Perfect location!! Super nice, helpful, smiley and welcoming staff.